Araya Rasdjarmrearnsook is holding her third exhibition at Gimpel Fils. The title of her show picks up on the work screened for Documenta 13, in the summer of 2012. During this most recent Documenta, a chalet was built for the artist, in Karlsruhe Park. Surrounded by a stockade, in this home Araya spent several weeks, with a dog. In the windows of the house were monitors facing out, screening her videos. The relationship between humans and animals is one of several linked concerns which appear in Araya's videos. Previously, Araya has exhibited The Class, in which the artist addresses herself to cadavers, laid out in serried ranks in a classroom. In a gentle question and answer session touching on metaphysics, Araya invited the class to explain their notions of death, with Araya helpfully supplying the answers when the bodies remained silent. 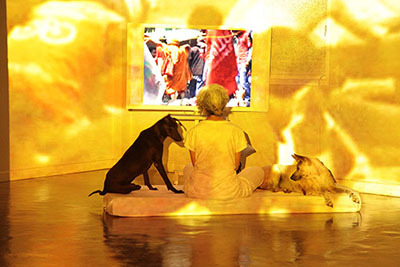 In a later exhibition at Gimpel Fils, The Two Planets, Araya screened videos dealing with cultural differences, or opposites, between Western art and oriental interpretations, between the secular nature of painting and the spiritual comment on it (by Buddhist monks), and between the educated urban painter's images and Thai peasant reflections on these same images. The Documenta theme, continued in the new exhibition at Gimpel Fils, is a contrasted, but paired, relationship between mammals, in this case humans and dogs. The dogs are strays, often damaged and sometimes packed into cages, which Araya's voice-over explains is a precursor to their disappearance. She is acutely aware of the strains and stresses of Thai society, reflected in its recent political history, which pitted supporters of rival candidates to engage in fierce confrontation prior to elections. For Araya, the dogs' world interacts in a slightly disturbing way with her own, similar to Kafka's use of these animals in his short story, 'Investigations of a Dog'.